The Burgess ticket below was contributed by Richard McRonald. Thomas McRonald, named as a Burgess on the ticket, was his great great grandfather. A transcription of the document precedes it and is followed by a brief history of the McRonald family in Maybole. Learn more about the Maybole Burgesses here. Maybole the twenty fifth day of August, Eighteen Hundred and thirty six. 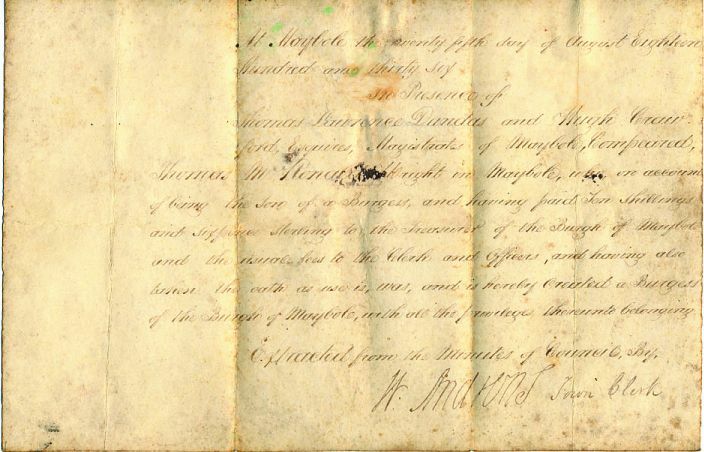 In the Presence of Thomas Lawrence Dundas and Hugh Crawford, Esquires, Magistrates of Maybole, Compeared, Thomas McRonald, Wright in Maybole, who on account of being the Son of a Burgess and having paid Ten Shillings and Six pence Sterling to the Treasurer of the Burgh of Maybole and the usual fees to the Clerk and Officers, and having also taken the oath as use is, was, and is hereby created a Burgess of the Burgh of Maybole with the privileges thereunto belonging. Extracted from the Minutes of the Council , By W. Andrews, Town Clerk.